Good morning, and happy Monday to you! I hope you had a wonderful weekend! Yep, it’s a big ‘ole chalkboard! And you know what? I love it! Plain, ugly, and just unlevel enough to drive me batty. 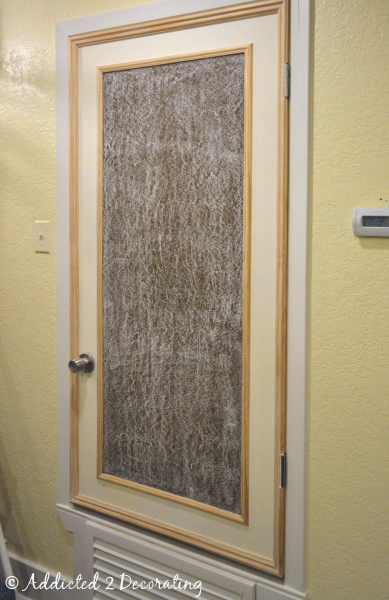 I considered replacing it with a standard six panel door, which is what I plan on putting on all of the other doors in the condo (and I already have on the bedroom). But the problem is that the height of this door would have to be cut since it doesn’t go all the way to the floor, and the cut line would go right through the lower panels. I just couldn’t bring myself to do that. It would have looked unfinished in my mind. And obviously the idea to paint everything out in the wall color to make it disappear didn’t work. 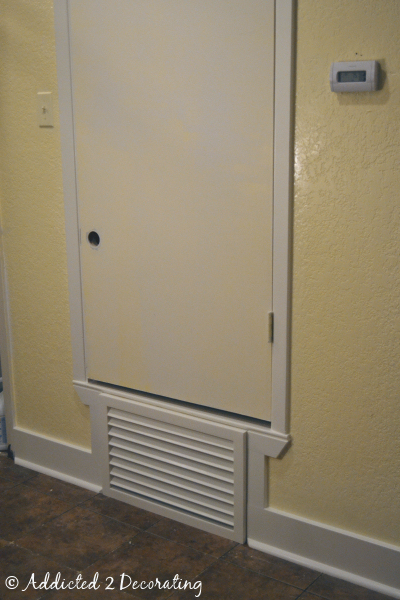 Let’s face it…there’s no hiding the fact that there’s a big ‘ole door with a big ‘ole vent underneath it. 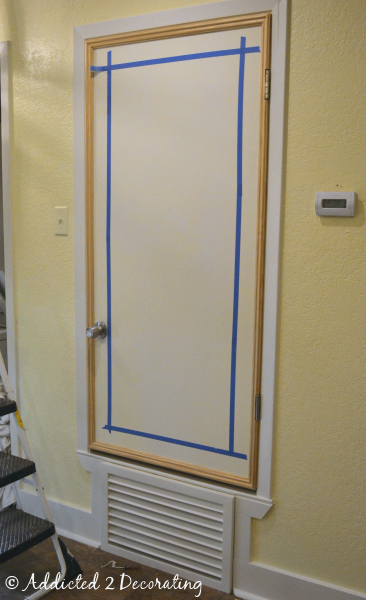 I started by using my miter saw to cut pieces of 1.5-inch decorative trim to go around the edge of the door. Fortunately with some careful placement of the moulding, I was able to disguise the fact that the door hangs slightly unlevel. 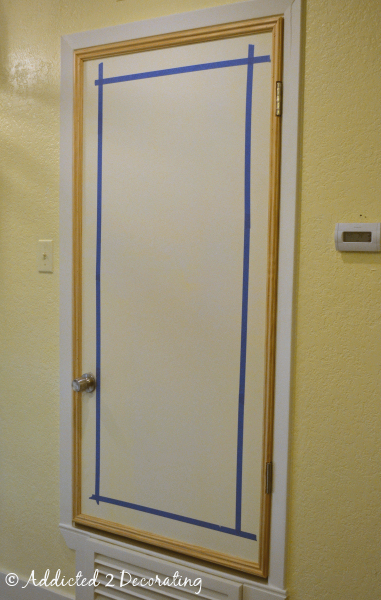 The trim that I used was the perfect size to go around the door knob. 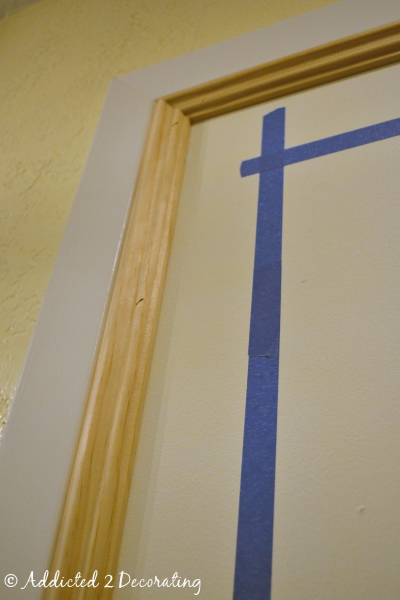 After attaching the outer trim, I measured in three inches to mark where I wanted the chalkboard section to be. 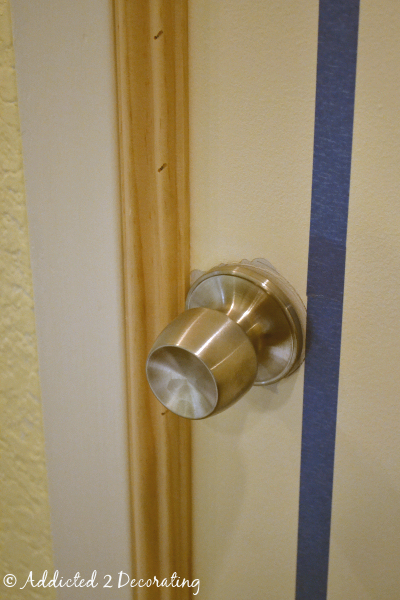 I had to be sure that this section (and the trim that I would be adding later) was inset enough to clear the door knob. But after three coats, it was looking really nice. 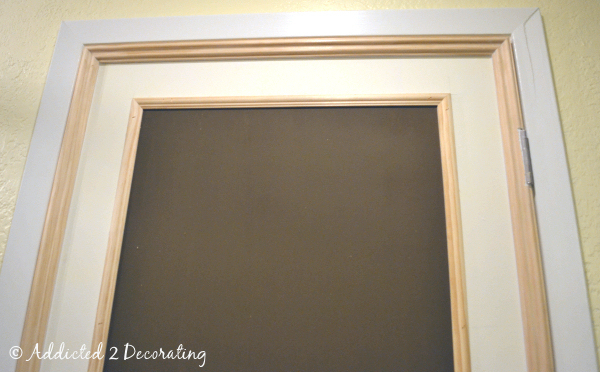 When the chalkboard paint was dry, I removed the tape and added smaller trim around the chalkboard. The door was already looking so much better! …then I rubbed it off with a rag. 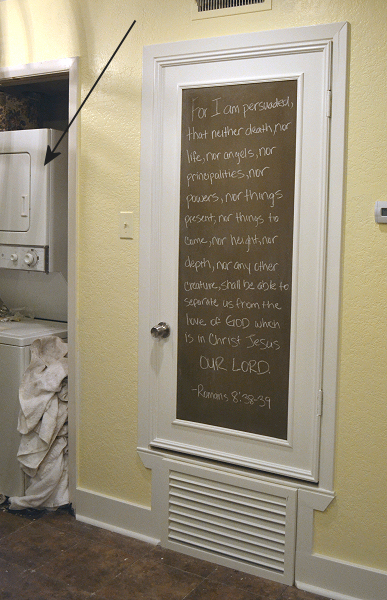 It definitely lightened the color some, but it gave it more of an authentic chalkboard look. Of course, I had to go ahead and test it out. I scribbled one of my favorite verses on it. 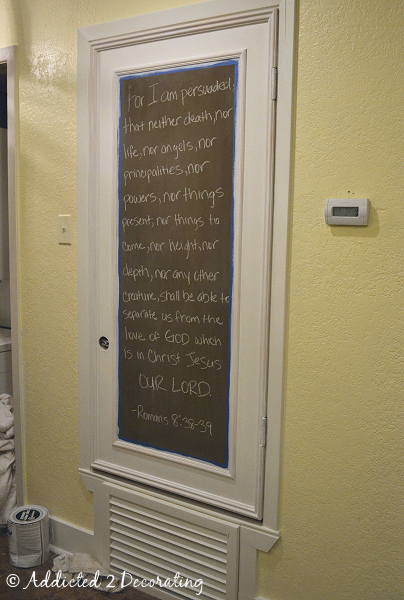 My handwriting left a lot to be desired, but the actual chalkboard paint worked wonderfully! 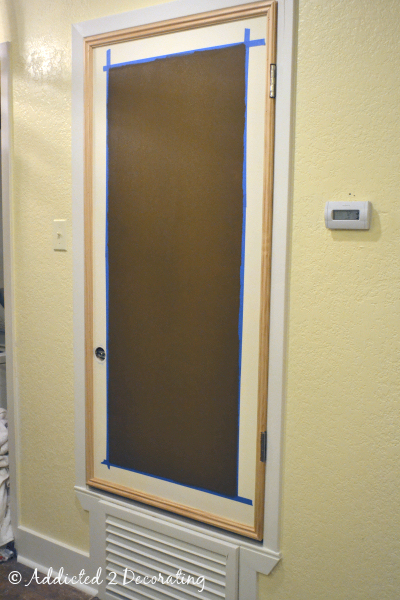 Next I taped off the chalkboard area, and gave the entire door a coat of primer. Followed by a coat of my semi-gloss trim paint. I’m just thrilled with how it turned out! Now let’s take a look at the before and after, shall we? Anyway, I removed the doors from the closet because they were just plain ugly. Plus, the washer inches forward every time I use it, so the doors would never close completely. 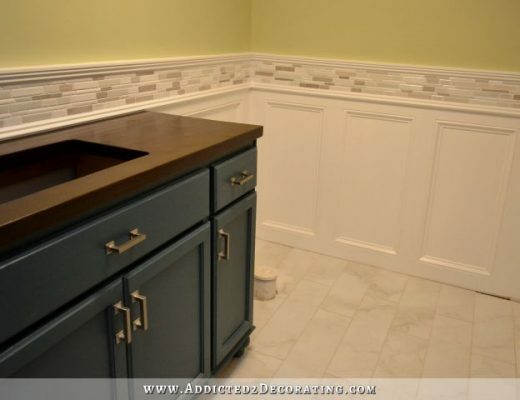 So I’ve got to find a solution for my creeping washer, and then I’ve got to cover the closet in some way that looks nice but doesn’t involve more doors. I’ve got an idea, and hopefully it won’t be too difficult or time-consuming. Stay tuned for that. Did you miss the details of my new air return vent that I made out of wood Home Depot yard sticks? You can see that tutorial here. 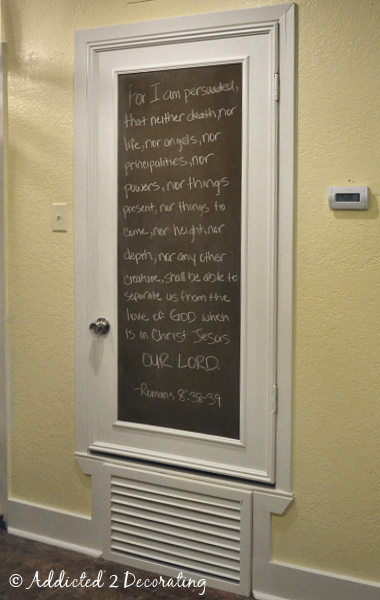 Next Post Out Of Curiosity: Are Chalkboard Paint Projects Sooooo Last Year? I knew you’d do something exceptional with that door…. Can’t wait to see your washer solution. Such a huge difference! 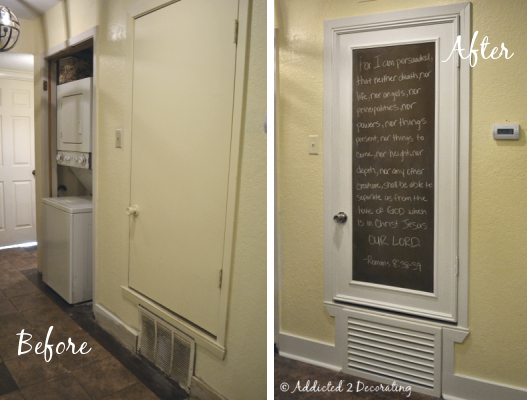 I love the chalkboard door and the way you framed it with moulding! FABULOUSNESS!!! Looks great, AND that is my favorite verse! 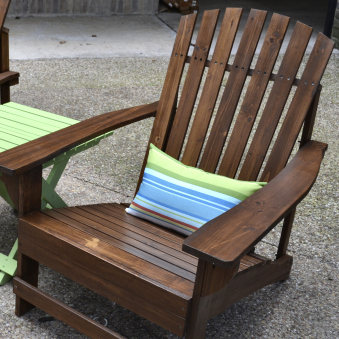 Maybe one day I’ll get some woodworking tools and be able to do such awesome stuff! I love the idea of the chalk board, I can use that as in organizer and helps me to reminds all the plans that i have to do. 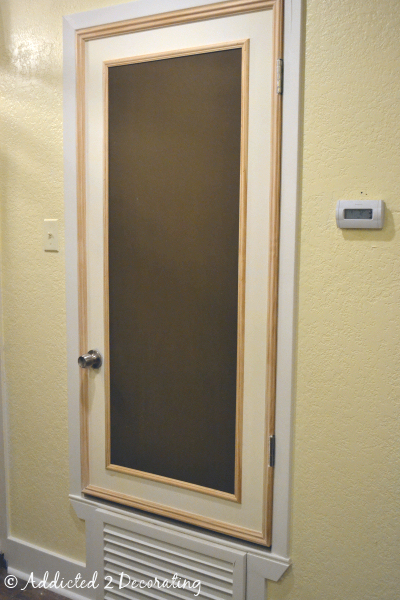 I still love chalkboards – and it’s a great way to disguise that door. 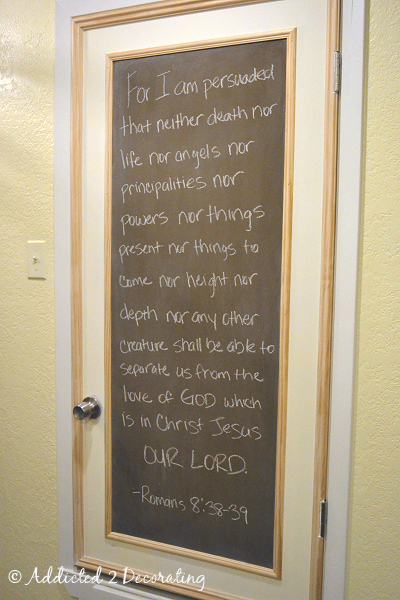 I have some chalkboard plans in the making too! I see the rest of the utility room is coming along – can’t wait to see! I hate my hollow core doors and they are EVERYWHERE in here ANNND an ugly brown color to boot. I love what you did! Phenomenal transformation! If only I had a tenth of your vision, and guts =). Woot Woot!! 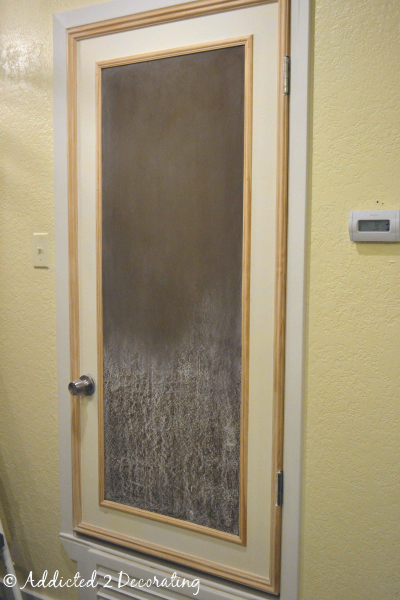 I love how the air vent turned out and united perfectly with the door! And…the detailing on the door is fabulous. You are a wonderful craftswoman!! And thanks for the reminder of the verse. I have a friend who needs those words. I am persuaded, too! What a great solution for the door. 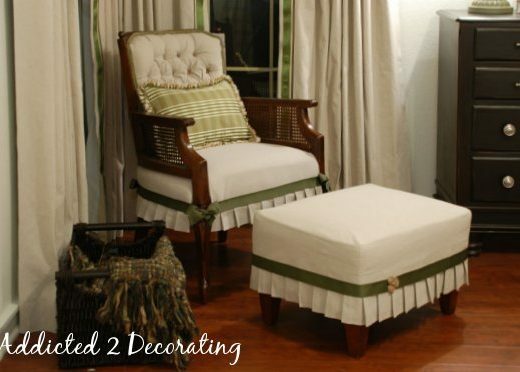 Kristi, love how you come up with such fun ideas and inspiration! Looks amazing! The washer walking as it’s used means it’s probably unlevel. Level it up and it should be fine. So creative, and it turned out wonderful. Very insightful and inspiring! Excellent idea! Does anyone know if i can use these ingedients on a strange door in the middle of my kitchen with a window in it? There are 2 extra windows in the kitchen, so i wouldnt be taking out any natural light. Maybe i can even tape off a peep hole and cover it with a sticky note when i dont want to use it. So pleased I discovered your blog! 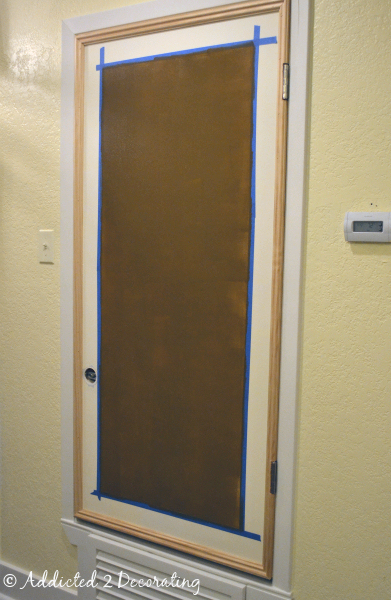 I’m gonna pluck-up my courage and go for gold with your HVAC closet door solution. Love it!